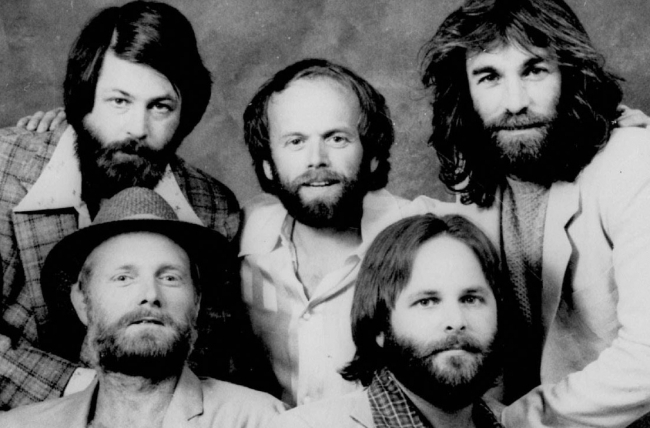 It looks like The Beach Boys biopic is about to be kaput, once and for all. The band’s drummer, Dennis Wilson, drowned 30 years ago this month, and was set to have his life retold in a biopic called The Drummer. But Aaron Eckhart, the man cast to portray Wilson, backed out in June of last year just before production was set to begin. This means that six-minute version of Wilson’s unfinished “Holy Man” (which featured Foo Fighters’ Taylor Hawkins and Queen’s Brian May and Roger Taylor) will probably never see the light of day if The Drummer doesn’t pull through. “It was a huge blow for us when Eckhart pulled out,” said Brad Rosenberger, the film’s music supervisor and a publisher of Wilson’s songs, explaining how Eckhart had spent six months learning to play the piano and drums for his role. Now, however, the trustee for Wilson’s estate (which represents his children) said that “there is no plan for proceeding with the Drummer project” in an email, refusing to respond with more details. Wilson’s children from other marriages, son Carl and daughter Jennifer, signed to co-produce the film in October of 2011, marking the first time the family had sanctioned a movie. This allowed director Randall Miller to secure the rights to Pacific Ocean Blue, Wilson’s solo album. Uneasiness regarding Jody Savin’s screenplay then contributed to the project’s delay. Rosenberger approached Wilson’s family with the film idea in 2008 and said that the children remained interested. “With everything in the right place, they would love to see a movie honoring their father,” he told The Hollywood Reporter. The current script doesn’t exploit Wilson’s drug addictions and other murky pastimes, instead picking up in 1977 when the handsome surfer recorded Pacific Ocean Blue and struggled to pay off his dues. On the upside, Capitol Records issued Made in California, a Beach Boys set that includes bootlegged and previously unreleased songs. We don’t have to say farewell to a glimpse of Dennis Wilson yet after all.